As of February 2009, page 145 is one of the last ones! Checking, correcting and validating malformed (or in most cases typo filled) XHTML code is a very useful thing to do when you're sick because it takes almost no brains whatsoever to do and it keeps you occupied instead of watching daytime television. 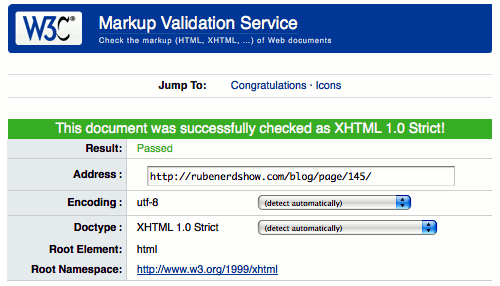 I can now say with 99.95% certainty (my solicitor advises me against ever being 100% certain) that every friggen page and post on this blog is valid XHTML 1.0 Strict. Sheesh. Pages are still being served with the text/html mime type instead of the technically correct application/xhtml+xml, again for compatibility with even the latest versions of Internet Explorer such as 7 and 8 Beta. Both of these could be handled and adjusted on the web server so that depending on what browser the client is accessing your site from you could dynamically add declarations and change mime types on the fly (I believe that's the W3C recommendation with XHTML 1.1) but it seems like a bit too much trouble to deal with now. I'll be keeping my eye on this though. Microsoft was sued by the European Union because they felt they were being anti-competitive by bundling Internet Explorer. While I believe that suit did have some merit, the really should have gone after Microsoft's appalling standards record instead. They've been responsible for untold amounts of damage by keeping back the progress of the internet and have caused frustration and head butting on walls by programmers and web designers.